Let's ring in the New Year with style! Dare I do it? Dare I?!? "I gotta fever! 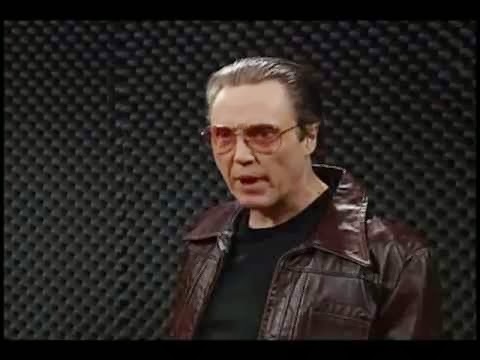 And the only prescription is MORE COWBELL!" If you don't know who Grandpa Jones was, you need some educatin' in the worst way! Louis Marshall Jones was a longtime fixture on country music radio and the Grand Ol' Opry. He picked up his stage name when he worked at WBZ in Boston and was playfully called "Grandpa" because he was so cranky in the mornings. Jones decided to make an act of it. That was 1935 and Jones was "Grandpa Jones" all the way up to his passing in 1998. He's long been regarded as one of the greatest banjo players ever. This year's DOCTOR WHO Christmas special: What DID Chris think of "The Time of the Doctor"? If if was nothing else, it had to be said: 2013 was the Year of the Doctor. ...and then came "The Name of the Doctor". More than half a year later, in spite of everything that we've watched since, I'm still feeling numbstruck by the season finale (find my review here). Throughout the ensuing summer and fall I think a lot of us were tormented with the thought: had Steven Moffat finally lost it?! For the first time ever Doctor Who seemed poised to derail completely. The image of that unknown incarnation of the Doctor, "the one who broke the promise", turning to show us the grizzled visage of John Hurt and those big letters onscreen letting us know in no uncertain terms "this IS the Doctor!!" is one that will forever be burned into my pop cultural gray matter. But "The Day of the Doctor" - the fiftieth anniversary special - restored all faith in Moffat as a showrunner. No, more than that: Moffat is arguably the finest custodian of Whovian mythology we have seen since... well, maybe since before John Nathan-Turner's era. "The Day of the Doctor" was everything an anniversary celebration should be: a "love letter" to the fans, a story that drastically expanded the Whoniverse and top it all off it was a story that totally changed the course of the series. For eight years we've seen the Doctor as a scarred and wounded veteran of the Time War: a man haunted by the choices he had to make in order to keep all hell from breaking loose across the width and breadth of creation. The Doctor is a wounded man no more. Now he's a man with the greatest mission of his life: to find Gallifrey. Well played, Moffat. Well played indeed! And that appearance by Tom Baker was the prettiest bow that a gift to the fans could possibly have had. So... what did I think of "The Time of the Doctor"? It was not perfect. But... yes, I loved every minute of it! It's glaringly obvious that Moffat was trying to shoehorn in a lot of material that likely had been intended for another season with Matt Smith as the Doctor, in an attempt to tie up all the loose ends since the Doctor last regenerated. Even so, I think it was as good a job as could possibly have been done. 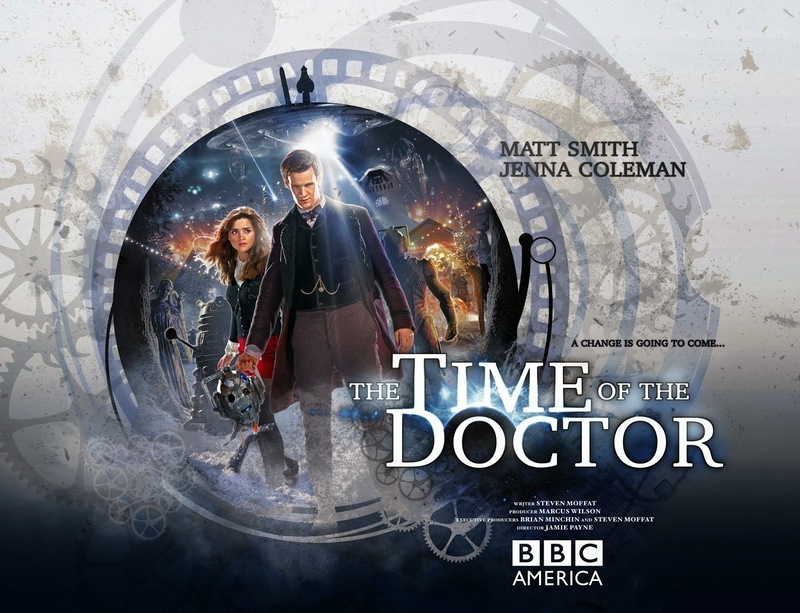 Ironically this is also the Doctor Who story that covers a bigger span of chronological time than any other previous: more than 300 years, from the time the Doctor and Clara first arrive in the town of Christmas up to the final showdown with the Daleks attacking Trenzalore. Yes, it would have been fun to have seen all of this unfold over another season... but we still got a great tale and a fitting Christmas special at that. Did anyone else think that the very-aged Doctor hearkened back to William Hartnell as the Doctor? Because I can't but think that maybe the First Doctor, in his younger days, was much like the Matt Smith we have witnessed during the past four years: Smith wanted his Doctor to be "an old man in a young man's body". Now we've seen him play the Doctor as a young man in an old man's body... and for some reason it makes Hartnell's First Doctor... well, more modern-ish Doctor, if that makes any sense. In any case it was a terrific and bold direction to take the Doctor in his final journey with the part. One of the bigger mysteries of Doctor Who is one that was set up all the way back in "The Deadly Assassin" nearly forty years ago: how would the "twelve regenerations" limit be dealt with? This was one of my favorite things about "The Time of the Doctor": Moffat showing us that the twelve regenerations have already transpired, because they included the Tenth Doctor's little stunt in "The Stolen Earth"/"Journey's End". We don't have to wait until Capaldi decides to turn in the keys to the TARDIS: that little matter is now dealt with, presumably for the next fifty years or so. At the end of which the Time Lords will probably decide they need the Doctor to stick around forever and just max out his life limit. And speaking of regenerations: Matt Smith's was the best ever. Yeah, I said it. I'll always love David Tennant's bow but in retrospect that seemed a bit too sentimental, perhaps owing to how Russel T. Davies had the Tenth Doctor revisiting all the major characters from the Davies era. 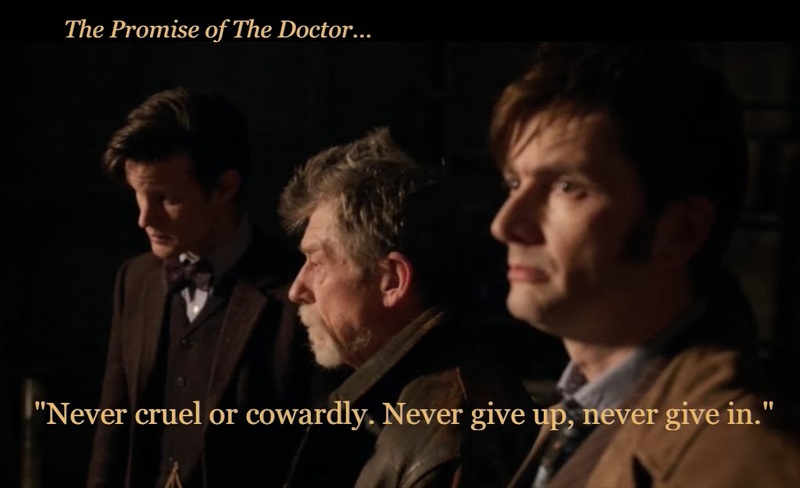 There was no such gesture in "The Time of the Doctor", and yet Matt Smith's departure was far more poignant and heartbreaking. During his final speech to Clara it was as if Smith was breaking the fourth wall and talking to us in the audience, telling us how much he appreciated his time as the Doctor and how thankful he was for our embracing him in the role. It was by far the greatest regeneration scene in the history of the series. It was the one by which all future regenerations will be measured, I think. And Matt Smith left in a bang: everything from Clara's finding the Doctor in his rocking chair on through the regeneration itself is pure storytelling gold. The scene of the Doctor atop the bell tower, raging defiantly against the Daleks ("We're breaking some serious science here, boys!" as he proclaims "Regeneration Number Thirteen... it's gonna be a whopper!" will go down as one of the most iconic Doctor Who moments ever). But as soon as the crying finally hit, we got hit with the shock of Peter Capaldi's uber-manic entrance as the Twelfth Doctor. It was the fastest regeneration ever and by far the most bewildering. I mean, when your new Doctor's first words are "KIDNEYS! I've got new kidneys!" you just know that there's some severe craziness incoming. Matt Smith, thank you. Because of you Doctor Who is bigger than it has ever been before. And because of you, bow ties have never been cooler! I'm the owner of an official Doctor Who bow tie... and I will be wearing it with pride for many years to come. Eleven's time has drawn to a close. Now bring on the Twelfth! "The Time of the Doctor" gets 4 and 1/2 Sonic Screwdrivers out of 5 from this blogger. And it's going to be a long, long wait until next fall when Doctor Who returns. Maybe if we're good Moffat and his crew will give us another mini-episode like "The Night of the Doctor". Please Mister Moffat, please?? Car made out of LEGO bricks... and it's drivable! 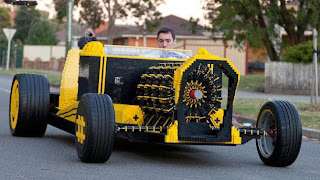 Proving once again that LEGO building is more than aesthetic art but also fully functional, an Australian and Romanian duo has constructed a life-sized roadster out of the celebrated toy bricks. And it just doesn't sit there: you can drive it too! It's not all LEGO: though the company makes tiny rubber tires for the minifig-scale vehicles, it's yet to enter the market in competition with Michelin or Goodyear. But that detail aside, the Super Awesome Micro Project funded and built by Australian Steve Sommarito and Romanian Raul Oaida is practically 100% LEGO blocks. Total number of pieces: about half a million. According to the news article, "the car uses compressed air to turn 256 pistons in four rotary engines — all made of Legos. Total construction time: 18 months, for a cost of about $40,000." It's not quite as big as the full-size X-Wing Fighter made of 5.3 million LEGO blocks, but hey: at least this baby can actually take you places! Crash here for more about the Super Awesome Micro Project's LEGO hot rod. And thanks to "Weird" Ed Woody for the heads-up! The most bestest scene from "The Day of the Doctor"
"The Day of the Doctor" became a truly epic event: the kind of cultural milestone ranking up there with the premiere of Star Wars in 1977, Woodstock and the final episode of M*A*S*H. The day after the fiftieth anniversary special of Doctor Who aired, Guinness certified it as the most-watched simulcast of a dramatic presentation ever. All very wonderful. Very beautiful. Steven Moffat and his team pulled off what can only be described as the perfect Doctor Who story for the fiftieth anniversary. One loaded with iconic scenes that have already become beloved by fans. But there was one scene that stood tallest of them all. It was the scene that most paid homage to where The Doctor has gone before while setting the stage for that which is yet to come. The scene that sent Doctor Who fans worldwide into a collective gasp followed by screams of wild rejoicing. And certainly what will prove to be the most pivotal scene of the series since its revival in 2005. That surely will go down as the high point of Matt Smith's career as the Eleventh Doctor. You just can't top sharing a scene with Tom Baker: the one who will, for many of us, forever be "my favorite Doctor".